The Cyberstorm PPC is a PowerPC-based accelerator for Amiga 3000(T) and 4000(T) as well as systems with compatible CPU-slot. With these innovative and powerful accelerator, a new dimension of performance is brought to the Amiga, with performance increases of 10 times and more compared to the fastest 68k based accelerators available today, resulting in a breath-taking performance. 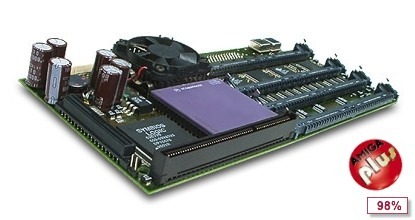 Primarily being designed as an upgrade board for existing Amiga systems, the Cyberstorm PPC incorporates an innovative dual-processor technology, where a fast PowerPC RISC processor is combined with a 68k processor, in case of the Cyberstorm PPC either a 68040 or a 68060 CPU. Both CPUs dynamically share the memory and system busses, what is necessary for a true multiprocessor behavior. While the original AmigaOS 3.x continues to run on the 68k CPU - as well as all existing applications do, providing 100% compatibility. Additionally, the Cyberstorm PPC comes along with a DMA-driven Wide ULTRA SCSI controller capable of transfer rates of up to 40MB/s. The board provides a 64-bit wide, extremely fast memory expansion option (which can be upgraded by using pairs of standard PS/2 type SIMMs) which is dynamically shared by the two CPUs. A 32-bit high-speed expansion connector with DMA access to the main memory is also provided for later upgradability like the CyberVisionPPC Graphic Board or G-REX 4000D/T.